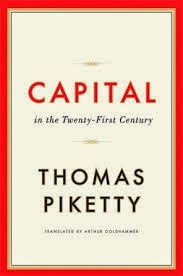 Thomas Piketty: Capital in the Twenty-First Century. (Le Capital au XXI siècle, 2013, Éditions du Seuil). Translated by Arthur Goldhammer. Cambridge, Massachusetts / London, England: The Belknap Press of Harvard University Press, 2014. Yesterday I received my copy of Thomas Piketty's Capital in the Twenty-First Century from the Academic Bookstore in Helsinki and started reading it at once at Café Aalto. The book appeared last year in French, and in an English translation in March. Major findings of Piketty and his fellow scholars have already been ardently discussed since over a decade, and they form a foundation for contemporary discussions on inequality. Piketty's magnum opus has been lauded by Paul Krugman among others: "This is a book that will change both the way we think about society and the way we do economics". "Piketty has transformed our economic discourse; we'll never talk about wealth and inequality the same way we used to." The book is an empirical study but it also presents a warning based on the statistical trends: the development that has been going on since the 1970s "generates arbitrary and unsustainable inequalities that radically undermine the meritocratic values on which democratic societies are based". The work of Piketty and his network of scholars has been possible thanks to the computing power of modern information technology. First in our age has it become possible to handle complete masses of income and wealth data of entire nations during centuries. Piketty's work is anchored in the tradition of political economy (Smith, Ricardo, Mill, Malthus, Say, Marx). On the other hand he builds on the foundation of Simon Kuznets, and his book is a remarkable contribution to the discussion on the Kuznets curve. Piketty analyses forces of convergence and forces of divergence in trends towards greater inequality. The fundamental force for divergence is that the annual rate of capital (r) is greater than the rate of the growth of the economy (g). (r>g). "Under such conditions, it is almost inevitable that inherited wealth will dominate wealth amassed from a lifetime's labour by a wide margin, and the concentration of capital will attain extremely high levels - levels potentially incompatible with the meritocratic values and principles of social justice fundamental to modern democratic societies." Piketty states that he belongs to a generation that turned eighteen in 1989 - the year of the Fall of the Wall. That generation has not had to pay attention to the trenches of the ideological Cold War with its biases in art, science, and culture. The people who grew up and the organizations which were established during the Cold War have sometimes still not been liberated from the trenches, 25 years after the Cold War ended. The hope lies with the younger generations. It has become possible to state fundamental and staggering truths which were ideologically taboo during the Cold War. "I was vaccinated for life against the conventional but lazy rhetoric of anticapitalism", states Piketty, who also reminds us that the radical left sometimes ignored the historical failure of the "real existing Socialism". Piketty's book is alarming to read. Piketty himself uses the adjective "terrifying" about the potential consequences. "The overall conclusion of this study is that a market economy based on private property, if left to itself, contains powerful forces of convergence, associated in particular with the diffusion of knowledge and skills; but it also contains powerful forces of divergence, which are potentially threatening to democratic societies and to the values of social justice on which they are based." Piketty also thinks that the "drift toward oligarchy" can be stopped. His suggestions include progressive annual taxes on capital and global agreements, including shutting down tax havens. Film-related: many films of recent years, fictional and non-fictional, have discussed epic fraud in the world of big capital, films such as Enron: The Smartest Guys in the Room, The Inside Job, Arbitrage, Wall Street: Money Never Sleeps, Cosmopolis, and Blue Jasmine. Even in fantasy adventures it has become a central theme (The Dark Knight Rises). But all these stories are beside the point of Piketty. Although the Piketty story is about injustice, it is not about fraud, crime, or conspiracy. There may be films which display the Piketty nightmare come true. They are fantastic dystopias. One of them is Metropolis, which was laughed at when it was released in 1927. When we screened it in our film society in the 1970s many found it corny. But today the trend of the development is again towards the extreme inequality of Metropolis. Another dystopia which reflects the Piketty prophecy is the Hunger Games series.